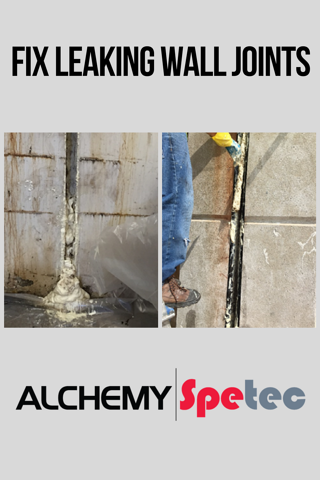 In this post I'll provide a brief overview of four different ways to fix leaking wall joints with Alchemy-Spetec polyurethane chemical grouts. Drill at a 45 degree angle, injecting on alternating sides of the joint. Drill deep into the wall, but don't drill through the wall and into the soil. Instead the drill holes should penetrate the crack itself, allowing for resin to seal the crack in the wall. Drill straight through the wall and into the soil. Inject through either side of the joint every 8 to 10 inches. Curtain grout behind the joint and into the soil, creating a leak barrier behind the wall. Soak AP Oakum in our resin, then dip it in water and shove it into the joint. Pack oakum to the back of the joint, working your way towards the front of the joint. Now you have a tight seal. Pack AP Oakum into the front half of the joint, leaving the back of the joint oakum-free. Then push an injection needle through the oakum, and pump grout to back side of joint. This will fill the void with foam and make a very good reinforced seal. The method you use will depend on the situation at hand. Want free technical guidance on your leak seal job? Call us at 404-618-0438 today! A few years back one of our customers used the fourth option in a big tunnel in Baltimore! To this day that joint is as dry as a bone!